Up and out to the train station on time – and of course the train was late, so, we didn’t make it to Porto until about 2pm. We are now masters of negotiating the train/metro and found our way to our accommodation – and wow! This is the one place we have booked an apartment and it is quite gorgeous. The owner, Yoan explained all that was local, what we need to see, where is best to eat with local cuisine and priced well and lots of other useful information. The apartment is close to the centre of the old town with a supermarket and laundromat around the corner. Vegetables and washing – what more could we want? So, washed, shopped and settled in before going for a walk through the old town to one of the six amazing bridges that Porto is famous for – apparently one of the best city views. 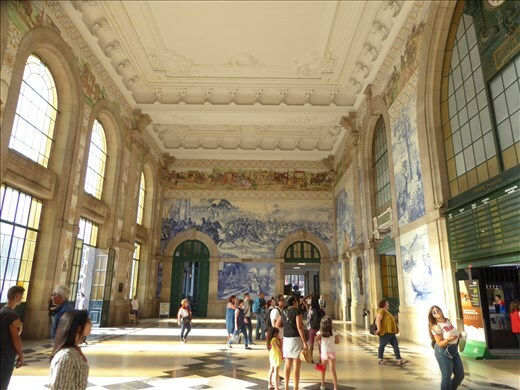 We also checked out the original main railway station and it is quite beautiful, decorated in the blue tiles that Portugal is famous for with the tiles making pictures which make up a story around the walls. Porto is a lovely city and far prettier (and with less derelict buildings) than elsewhere in Portugal that we have been. It just has a lovely feel and we are both looking forward to the next couple of days.